about this book: Kat solves the mystery of her "Bad Spelling" in the first book of the series. In the second book, she, her new-found grandfather, brother Rune, and changeling troll boyfriend, Andy are supposed to return her deceased father's frozen body to Siberia for a proper burial. She's not very happy when Andy doesn't arrive at the island with her grandfather, but figures he's moved on now that he's human. Still, her father's body needs to go home, so they set out on the journey in a 30' boat. A strange storm comes up and, when Kat sees her father's ice block slipping, she grabs hold only to be thrown into the raging sea with her dad. Fortunately, his block of ice floats, so she climbs aboard. Meanwhile, the rest of the party have lost sight of Kat and continue on to Novaya Zemlya, a barren island north of Siberia. They're captured by mutants, the victims of the Russian nuclear testing during the Cold War. 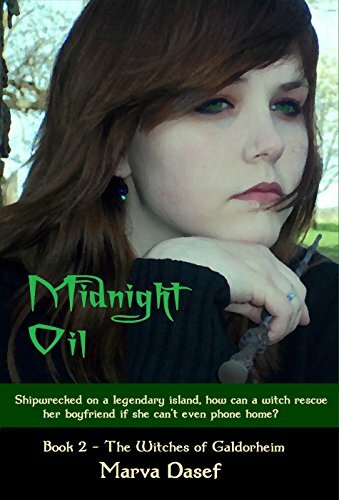 While the mutant Nenets tribe holds Rune's girlfriend hostage, he and Ivansi have to find the magical Midnight Oil to cure the mutants. But they don't know where it is. They also want to find Kat, but haven't a clue where to look for her. But Kat has resources of her own, and all the parties are headed to the same destination: a Finnish forest occupied by an evil tree spirit named Ajatar. They've all got plenty of trouble, but adding a ticked off spirit to the story complicates everything even more.